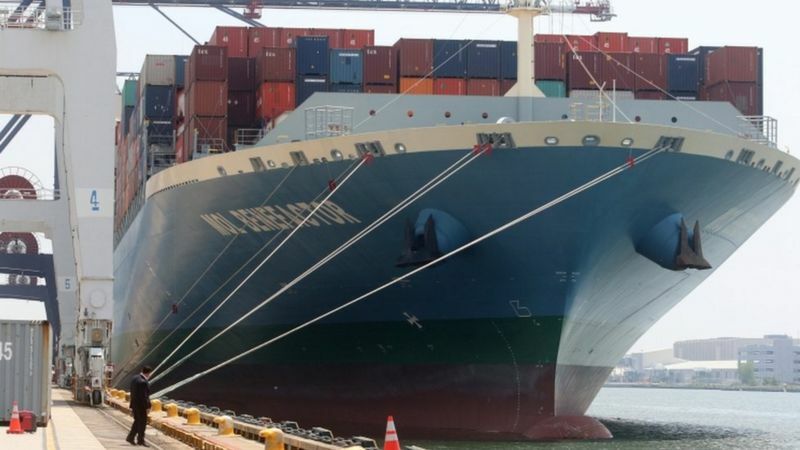 A Chinese container ship has hit a wall of the recently-widened Panama Canal, amid concerns that it has less space for manoeuvres and could be unsafe. It is the third accident of this kind since the multi-million dollar expansion opened a month ago. Workers' groups say the new locks are too small for safe operations now that the canal can take ships three times larger than before. The Panama Canal authority says it is investigating the incidents. The Xin Fei Zhou, owned by China Shipping Container Lines, suffered a large gash in its hull and is now undergoing repairs. The new locks are designed for ships to use tugboats to guide them through the canal. In the old canal locomotives (known as "mules") would keep the ships correctly aligned as they passed through. A study for the International Transport Workers' Federation released earlier this year concluded that the new lock chambers were too small for the tugboats to be able to manoeuvre properly. Work on the expansion began in September 2007 and was originally planned to finish in 2014. Following delays caused by construction workers' strikes and disputes over cost overruns, the date for completion was pushed back to April 2016. The first voyage through the new expanded canal was on 26 June. Seven years later, and nearly two years late, the locks have finally been declared ready to accept the new generation of giant ships that carry much of the world’s cargo but cannot fit in the original canal. To mark the occasion, Panama has invited 70 heads of state to watch on Sunday as a Chinese container ship becomes the first commercial vessel to attempt the passage from the Atlantic Ocean to the Pacific through the larger locks. artificial lake and glide across on a 50-mile water bridge. Grand in scale and beautifully imagined, the original Panama Canal is an engineering marvel. Ships glide through on a 50-mile water bridge. The lock gates, some weighing more than 700 tons, are watertight and buoyant, so finely balanced that should the power fail, a single person can manually open and close them. Built by the United States after a failed attempt by the French left thousands dead, the canal operated with hardly a false note for 100 years using this procedure: As a ship approaches the locks, cables are attached to electric locomotives that run on rails alongside each of the lock walls.They draw the ship into the chamber, bring it to a stop, then draw it into the next chamber. Their constant tension winches keep the ship centered, ensuring safe and timely passage. Three locks raise the ships 85 feet to Gatun Lake, which supplies water for the canal and drinking water for much of the country. Three more locks lower them back to sea level. All of the locks are filled and emptied by gravity, without pumps. lowers ships through the locks. Over the decades, the canal made Panama, with few natural resources, a key square on the economic chessboard: a major banking, trading and airline hub, not to mention a transit zone for drug dealing and money laundering. Then China’s economic ascent ushered in a new era. Ships became bigger. The more cargo they carried, the lower the cost. By 2000, ships were being built that could not pass through the canal. Fearing that its waterway might end up like the long-outdated Erie Canal, the canal authority set out to build a bigger one. Contractors faced some of the same challenges that the Americans did a century before: tides up to 19 feet on the Pacific but only two on the Atlantic, unstable soil, and torrential downpours. They also had to excavate and dredge without disturbing the original canal operating alongside. On top of that, just as it was about to solicit bids, the canal authority received some frightening news in November 2007. Jonathan Harris, a geologist working for the authority, reported that Panama’s earthquake risk was far greater than previously believed. By his assessment, the area is vulnerable to earthquakes of up to 8.0 magnitude, according to a diplomatic cable released by WikiLeaks. So serious is the risk, Mr. Harris warned, that his consulting company “prohibits any of its employees working in Panama from living above the first floor in any building,” according to the cable. The next month, the American Embassy heard similar warnings from Mr. Gath. Based on what he said, Panama’s earthquake risk was equal to San Francisco’s. Even so, three consortiums — including one led by Bechtel, an American company with an international reputation for taking on big, difficult projects — pursued the contract. The financially weakest consortium was led by a Spanish company, Sacyr Vallehermoso, which American officials called “nearly bankrupt” in one cable and “technically bankrupt” in another. Sacyr’s consortium included a Panamanian company owned by the family of the canal administrator at the time, Alberto Alemán Zubieta. The company, Constructora Urbana, in which Mr. Alemán himself previously owned stock, had already done millions of dollars in business with the canal. The other two members were Impregilo, a large Italian contractor, and Jan De Nul, a Belgian company that specializes in dredging and excavation. In March 2009, after 15 months of contentious negotiations, the three consortiums submitted their sealed bids before a packed auditorium, with the president and diplomatic corps as witnesses. To heighten the drama, a motorcade delivered the envelopes to a vault at the National Bank for safekeeping. The one with the best price and design would win. That July, with the nation watching on television, the bids were opened, and the result was a shocker: The underdog Sacyr group had won. Bechtel and American diplomats were incredulous. Sacyr could not even “pour the concrete” for that amount, a Bechtel representative told the embassy, according to a diplomatic cable. While Sacyr’s low offer meant Panama received a bargain on price, some viewed it as too good to be true. A few days after Christmas in 2009, at lunch with Barbara J. Stephenson, the American ambassador, Panama’s vice president, Juan Carlos Varela, confided his fears. He elaborated in another meeting with an embassy official several weeks later: “You don’t mess around with something as important as the canal. When one of the bidders makes a bid that is a billion dollars below the next competitor, then something is seriously wrong,” he said, according to a diplomatic cable. Given the canal’s importance to American commerce, the embassy assured Washington that it would closely monitor developments. And it had another concern: the increasingly bizarre behavior of Panama’s president and former canal minister, Mr. Martinelli. By the end of his term in 2014, he would appoint most of the canal’s board of directors. Mr. Martinelli is now best known for something else: presiding over an administration that is the subject of roughly 25 corruption investigations. In a confidential cable, Ms. Stephenson noted Mr. Martinelli’s “penchant for bullying and blackmail,” as well as his plan to wiretap political adversaries, in part to find out whether his wife was having an affair. Karen Smits arrived in Panama the day the Sacyr group won the contract. She was 27 and had grown up on a farm in the Netherlands. While her gender, blond hair and blue eyes made her stand out among the male construction workers, few people knew who she was or why she was hanging around their lunchrooms, hallways and in the field. That would soon change. Ms. Smits, an organizational anthropologist, had come to the canal for her Ph.D. thesis on the cultural dynamics within the consortium as it set out to build the new locks. But after 85 interviews over a year, she came away with much more: a contemporaneous account of the tension and conflict emanating not just from cultural clashes, but also from the stress of completing a huge project on a rock-bottom budget. “The top management of the European companies had not been entirely involved in the final stage of the tender process,” one consortium official told Ms. Smits, adding that when told the size of the winning bid, they were incredulous. Some officials said the collaboration was like being trapped in a war or an arranged marriage. One Belgian manager told Ms. Smits that he had been instructed “to get rid of his Anglo-Saxon management skills, because those were too organized and too structured for operating in this company.” The manager promised to change immediately and, with a smile, ordered a few glasses of wine at lunch. Concern over costs quickly escalated into heated exchanges over who was going to do what and for how much. “It is difficult to be flexible if you don’t have a budget to adjust some things, and you know the project is never going to go as planned,” Ms. Smits said. Time was another issue. The contract called for the work to be completed in 1,883 days so that the opening would coincide with the 100th anniversary of the canal’s 1914 inauguration. They made one fact abundantly clear: The new canal would operate very differently from the old one. This change weighed on Mr. de la Guardia, the stocky chief of the tugboat captains’ union, as he sat in a Panama City cafe one afternoon last December. “We don’t think it is going to work,” he said. His concern stems from the canal authority’s decision to abandon locomotives to guide the ships. Tugboats will now push and pull vessels that are more than three football fields long and stacked with up to 13,000 containers, nearly three times as much as the old, smaller ships. Tugboat captains fear that their boats will be overmatched. Officials chose the new method after studying canals around the world, particularly Belgium’s Berendrecht Lock, which uses tugboats to move neo-Panamax ships. Not only is it cheaper, the canal authority said, it is more practical, given the ships’ immense size. The authority excluded canal workers from much of the planning, according to union representatives. But the locks’ size is the captains’ biggest concern — and they illustrate it on napkins, sheets of paper and blackboards. The new locks are 1,400 feet long and 180 feet wide. Big container ships are 1,200 feet long and 160 feet wide. Tugboats fore and aft measure nearly 100 feet each. Do the math, they say. In fact, a feasibility study done by the canal authority in 2003 concluded that “for the tugboat system to work safely and efficiently in the locks,” the locks needed to be 328 feet longer and 40 feet wider than the big ships passing through. By that standard, the new locks should have been 1,528 feet long and 200 feet wide. The current size, the captains noted, leaves little or no bailout room for the tugboats at either end should a problem arise. “The mass of a ship, 122,000 tons coming at you — it’s going to run me over,” one captain, Manuel Ceballos Loaiza, said. With such a large surface exposed to the wind, the stacked cargo also acts as a sail, magnifying the tugboats’ challenge. “We are five months away from inauguration, and I don’t know what I am going to do,” Mr. Ceballos said in December. “I haven’t been trained. They haven’t discussed the procedures. We have been asking them.” Five months later, captains said little had changed. In late May, Mr. Rankin and two fellow pilots traveled to Europe at union expense to research how ships might move more safely through the locks. Mr. Rankin said his union members were especially worried about the black plastic buffers, or fenders, attached to the canal walls to protect ships and the canal itself. “We feel they are not good enough,” he said. The pilots studied cushioning methods used in Europe and concluded that large, floating fenders would be more effective. Several years ago, the canal authority quietly tested its new method in the original canal, using smaller vessels. 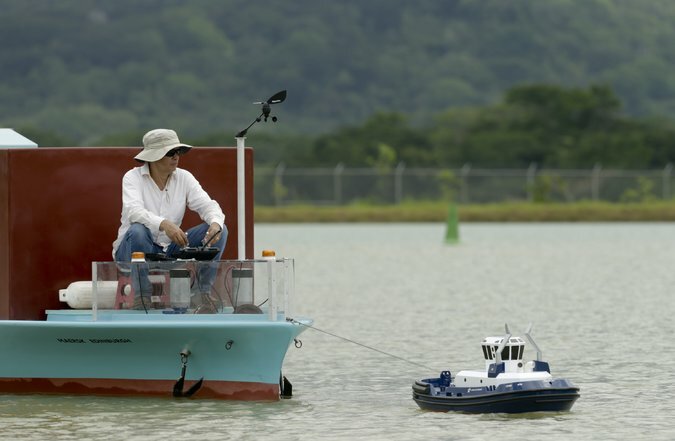 The pilots now train on a small artificial lake, using miniature ships and tugboats scaled to one twenty-fifth of their actual size. They also use simulators. But, as Mr. Rankin pointed out, the pilots’ success also depends on tugboat captains’ ability to get ships in and out of the locks. “They haven’t been trained properly, and that needs to be corrected by the administration,” Mr. Rankin said late last month. Mr. Quijano said the captains had received proper training, including classes and simulations, and called their complaints a contract-negotiating ploy. He added that the locks could be made longer by using a backup gate; that would not, however, increase their width. To assess the safety and efficacy of the canal authority’s plan, the International Transport Workers’ Federation hired experts to conduct simulations involving neo-Panamax ships. The study, released this year, concluded that the ships could pass through the locks under perfect, windless conditions, but would have trouble on windier days. “We face a situation where those working on the canal, and those passing through it, are potentially at risk,” said the union’s general secretary, Stephen Cotton. The canal authority said the study was seriously flawed. Mr. Rankin said his union had recommended using more tugboats to position ships before they entered the locks. 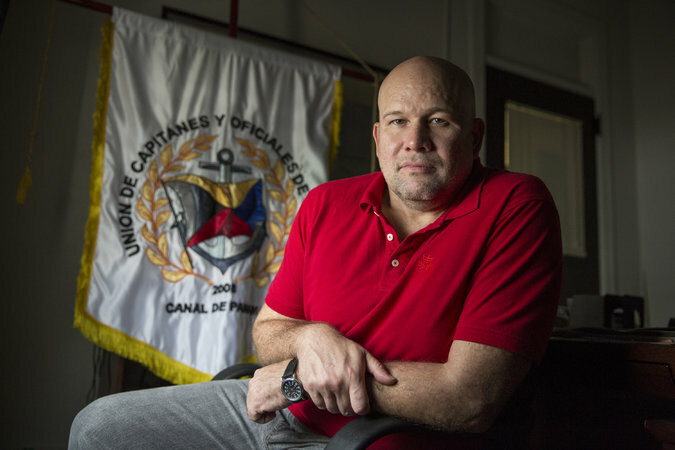 On a thick, overcast morning in April, Eric Viluce, a captain with 36 years of experience on the canal, climbed aboard the Cerro Santiago, a bulbous Spanish tugboat nesting just inside the canal’s Pacific entrance. Mr. Viluce passed a lounge and kitchen before climbing a steep, winding staircase to his glass-enclosed captain’s aerie. A large color monitor showed ships moving through the nearby locks. This day had been set aside to demonstrate the capabilities of the Santiago, one of 14 “tractor” tugs purchased primarily for the new locks. Mr. Viluce slowly backed the Santiago from its mooring and into the open canal before directing it toward the Celebrity Infinity, a white cruise ship heading for the old canal’s first set of locks. This was when the Santiago’s navigational peculiarities became apparent. “I’ll go stern first,” Mr. Viluce announced. Easier to handle that way. The Santiago is no outlier. Each Spanish tugboat can do a 360-degree spin. Each can move sideways, as Mr. Viluce demonstrated by positioning his boat perpendicular to the moving cruise ship and keeping it there. But to go confidently in a straight line, bow first — that’s another matter. The tugboat captains say precise control is necessary to maneuver a massive ship in and out of the new locks. It is akin to threading a needle while fighting wind, currents and waves. And moving backward is not an option when pulling a ship with a line tied to the stern. Shippers will pay an estimated $800,000 to send a neo-Panamax vessel through the canal, and dents and delays are not good for business. The tugboat manufacturer, Astilleros Armón, did not respond to requests for an interview or to written questions. But confidential documents obtained by The Times show a close business relationship between Armón and Jorge Alexander Quijano Richard, the canal administrator’s son, a lawyer who worked for MLS & Associates. “Our law firm sent Mr. Quijano to Spain to visit Astilleros Armón, given that one of his main duties was to do marketing abroad to look for new business opportunities for the firm,” MLS said in a confidential response to a legislative inquiry in Panama. Mr. Quijano joined MLS three days after the canal authority awarded the $158 million tugboat contract to Armón, records show. When he left for another law firm in 2013, he took Armón with him, MLS told investigators. In an email, Mr. Quijano said he had not been involved in the bidding process, had not spoken to his father about the contract and had visited several companies on his trip to Europe. Canal workers said they had also experienced problems with other tugboats, specifically Chinese boats with inferior clutches. The canal authority replaced the clutches for close to $10 million, but that did not fix the problem, according to several captains. “The result has been worse,” Mr. de la Guardia said. 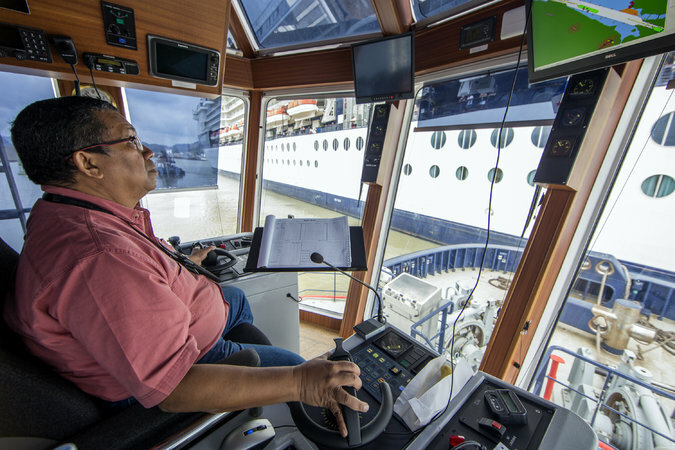 He added that on any given day, no more than 30 of the fleet’s 46 tugboats are operational: not enough, he said, to operate the old and new locks. It is no small undertaking, making concrete: good, solid concrete that will last 100 years and withstand the corrosive effects of saltwater in the locks. It requires cement — a pasty concoction of various chemicals — plus sand, rock and water. Too little cement, and the mixture will be porous and difficult to place. Too much cement, and it will be smooth and easy to place but susceptible to cracking. The challenge is to find the correct combination of all components. Which was where the problems began. Concrete manufacturing plants were built on both ends of the canal, but the raw materials, known as the aggregate, were excavated from the Pacific side. The aggregate, though, was not especially suitable for concrete. Bechtel, the losing bidder, had suspected as much. “There was an enormous issue with concrete,” said Paul Gibbs, who led Bechtel’s effort to win the contract. “We realized the aggregate on the Pacific side of the locks did not have sufficient integrity to make concrete.” So Bechtel planned to import the aggregate. Expensive, but necessary, Mr. Gibbs said. Early on, the winning consortium, with its small concrete budget, also found the rock quality poorer than expected, but it made adjustments. Then came a standoff. In the end, the consortium sought $463 million from the canal authority to cover its losses from the long delays and poor-quality basalt. An arbitration panel sided with the consortium, awarding it more than $230 million. Concerns over concrete would figure in the resignations of two prominent consortium employees. One was Anthony De Vos, a geologist with the Belgian company, Jan De Nul. In July 2013, Mr. De Vos announced his departure in an email to colleagues, saying he was happy to be free of “dictatorial managers.” He singled out “numerous erroneous decisions” involving concrete. “It is a big pity for Jan De Nul that we ended up in such a mess, but the damage is irreversible,” Mr. De Vos wrote. He declined to elaborate when reached recently by telephone. Johnson Spratt, an excavations manager on the Pacific side, said he, too, had resigned in part because of concerns about concrete. When asked for details, Mr. Spratt quoted an old Spanish saying, “Lo barato sale caro”: That which is cheap comes out expensive. Work eventually resumed, but when Mr. Quarta, the consortium’s new chief, arrived in Panama in early 2015, he found “very low morale” and a financial crisis. He said he had rallied his workers and gotten the project back on track, and by the middle of last year, the end was in sight. Then, suddenly, during water tests in the canal, a public relations disaster: photographs and video showing water gushing from concrete in one of the Pacific locks — the same locks near the earthquake faults. The problem had remained a secret for more than a week. But the images, posted anonymously on Aug. 23 by a canal worker, seemed to confirm everyone’s worst fears. This was no small leak. Water spurted from cracks extending across nearly the entire width of the lock, according to Ilya Espino de Marotta, the executive vice president for engineering at the canal authority. The breach occurred in a concrete block separating the lower and middle chambers. For the canal authority, the delayed disclosure only magnified the embarrassment. Asked by a legislator if he had tried to hide the leak, Mr. Quijano acknowledged only that he had taken too long to inform the public. “It’s not that we weren’t going to make it public, because we make everything public,” he said, explaining that he had been waiting for the consortium to determine whether the problem was the design or the quality of the concrete. “We’re trying to have them give us an answer, and they haven’t given us one,” he complained. Some days later, a consensus emerged: The design, not the concrete, was at fault. Ms. Marotta said in an interview that the leak had occurred only because the concrete was subjected to extreme pressure when one chamber was empty and the next was full. During normal operations, both chambers would contain water. To fix the problem, the authority had two options: Tear down the concrete and rebuild it, an expensive remedy that would cause further delays, or drill holes and insert steel reinforcement bars. The decision was made to reinforce. Ms. Marotta said there had already been reinforcement in the affected areas, just not enough. A nagging question, however, remained. If this chamber leaked, how about the others? And, indeed, a smaller leak was soon found on the Atlantic side. A month after the first leak was discovered in the Pacific lock, further cracks were found during a new test. In one spot, water was not flowing, although the cracks were wet. But water was flowing from a much longer crack, measuring about 82 feet, according to a structural engineer’s report. Now, the locks are patched up, their christening near. But in the Panamanian circles where people talk and worry about the canal, there is little unanimity about what exactly went wrong and what should have been done about it. “The structural engineers inside the canal, who don’t want to give their names out of fear of being persecuted, have pointed out that those locks need to be knocked down and built again,” said Zulay Rodríguez, a lawyer and the chairwoman of a legislative subcommittee created to investigate possible irregularities within the canal authority. Humberto Reynolds, a concrete expert, was not involved in investigating the leaks, but has monitored the situation and discussed it with fellow civil engineers at meetings of the Panamanian Society of Engineers and Architects. “The work hasn’t even been inaugurated, but it’s already being repaired,” he said. Mr. Reynolds, who voted against the canal project, said he believed the problems stemmed from the wrong mix of concrete ingredients and substandard pouring practices. He called the work full of “intolerable anomalies” and criticized what he said was a trial-and-error method of fixing them. Canal officials said all the problems had been properly repaired. “We are confident the concrete will last 100 years,” Mr. Quijano said. 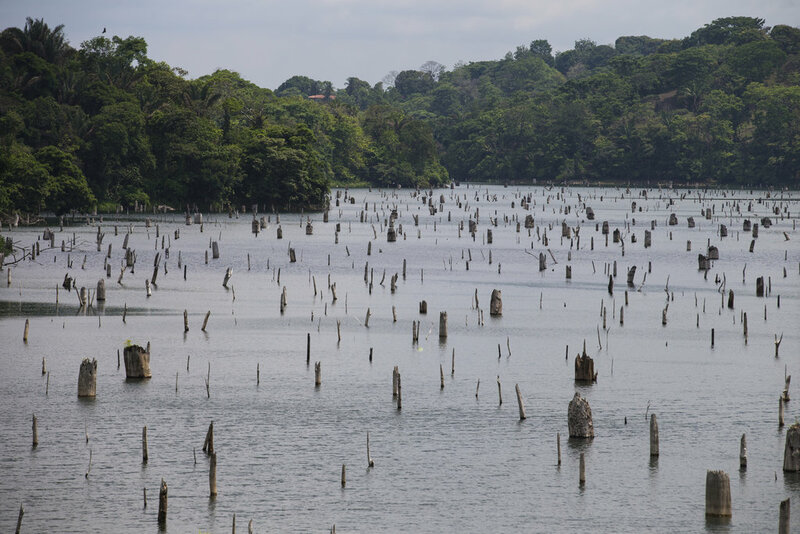 In good times — and in Panama, that means when it rains — Gatun Lake is 85 feet above sea level. From its shore, you can see the Atlantic Ocean spreading out to meet the horizon. Without Gatun, Panama would be barely a footnote in history. Without Gatun, there would be no Panama Canal or the 10,000 people it employs, or the cash that pours into the national treasury, or the audacious skyline that speaks of money and power. Once the world’s largest artificial lake, Gatun floats the ships that cross the canal and fills the water glasses of many, if not most, of Panama’s residents. And that is why, on Feb. 17 of this year, the commercial world took careful notice of “ADVISORY TO SHIPPING No. A-05-2016”: a warning that Gatun was not in good health. “Gatun Lake’s level is currently at 81.75 feet, the lowest on record for this time of the year,” the advisory said. The canal’s watershed runoff, it noted, was the second worst in history. Rainfall last year was 36 percent below normal. One month later, the canal authority instructed shippers to lighten their loads so their vessels did not hit bottom. A week and a half later, they were told to lighten them more. And 10 days later, even more. Like the leak, the water shortage hit at an inopportune time. 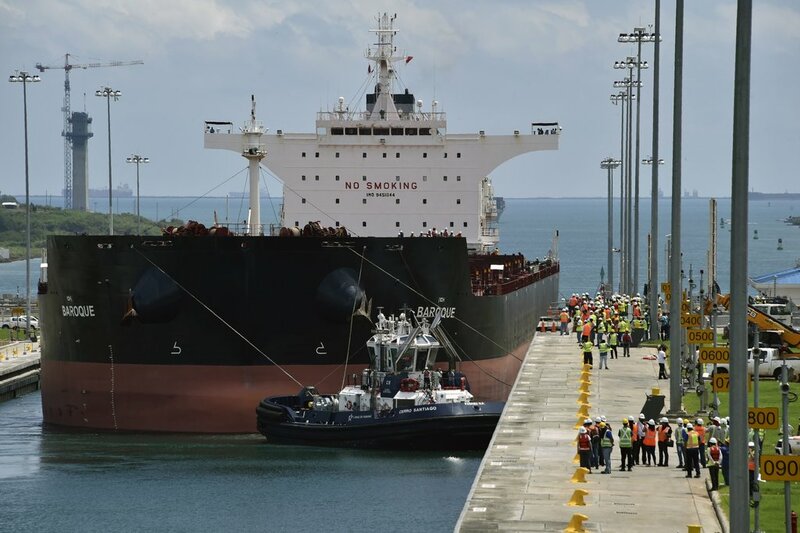 Just one day after the last load warning, the canal authorities issued instructions for neo-Panamax vessels seeking to use the new locks after they open. The large ships would not be able to carry much more than the smaller vessels in the old passage — hardly a good return on investment for shippers or the canal. Load restrictions are not new, but these came after Gatun had been dredged to collect more water for the new locks. 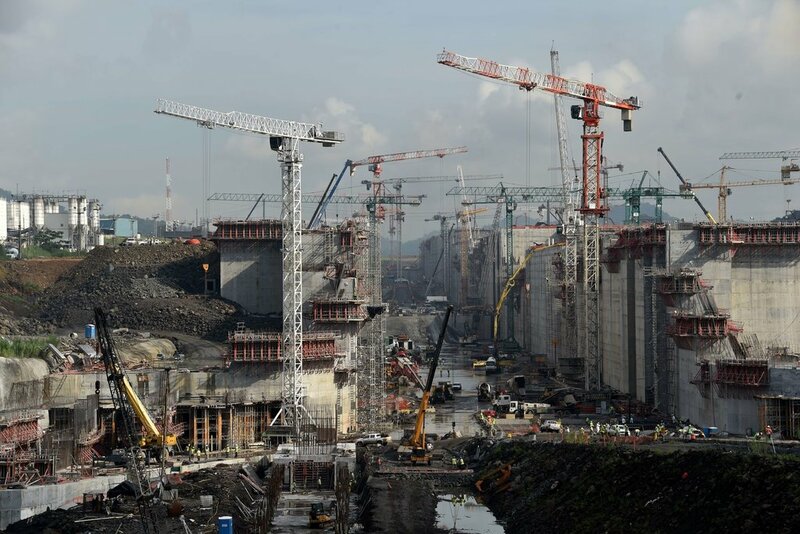 When they open, Gatun will have to supply nearly twice as much water for the old and new locks combined. Mr. Quijano declined to answer questions about water availability. Canal officials blamed El Niño for the drought, and the load restrictions were eventually lifted after several days of heavy rain. But this weather pattern was no more unexpected than the prospect of more shortages due to global warming and increased public water consumption. In fact, two international banks had questioned the wisdom of expanding the canal without a new water source. In 2008, the Inter-American Development Bank called water availability “the principal project risk,” according to a consultant’s report last year. Canal officials, too, recognized the need to find more water as they began planning for the new locks. But their solution ran into a political firestorm. In 1999, Mr. Alemán, the first canal administrator, had helped secure passage of a law giving the canal authority control over the western watershed, where dams could create a new reservoir. The impoverished people who would have been displaced were not pleased, and with the help of a Roman Catholic Church activist group, they protested. It was morally wrong, the local bishop, Msgr. Carlos María Ariz, wrote in a letter to Panama’s president, to destroy the farmers’ “lifestyles and traditions” for the sake of the canal. The government pushed back. Under pressure, the church appointed a new bishop and fired the activist group’s leader, Héctor Endara Hill, after 20 years of community work. Another leader of the protests, Francisco Aperador, whom the church had sent to Panama to work with the indigenous population, was expelled from the country, Mr. Endara said. The canal’s chief engineer, Thomas Drohan, was forced out around 2000, after criticizing the watershed plan, Mr. Endara said. Mr. Drohan declined to comment for this article. But ultimately, fearing the loss of a national referendum on canal expansion, the legislature reversed itself in 2006 and rescinded the law. The canal authority switched positions, as well, and said it did not need a new reservoir. Water-saving basins were built so the canal could reuse 60 percent of the water that fills the locks as ships pass through, according to canal officials. With the protests quelled, the canal expansion passed with 70 percent of the vote in the referendum, though less than half of the population turned out. On the morning of June 9, the training wheels came off as the first neo-Panamax ship, the Baroque Valletta, entered the first of three locks on the Atlantic side. With the official opening just two weeks away, canal officials wanted to be sure their locks worked as planned. The Italian consortium member, now called Salini Impregilo, had invited foreign journalists to fly in and watch. But the canal authority had other ideas. Impregilo told the authority that the crossing would not remain a secret because hundreds of canal workers would be watching, cellphones in hand, taking pictures. Canal officials relented. The journalists came. Under a mostly sunny sky, history was made, as the Baroque passed through all three locks before anchoring in Gatun Lake. Leading the way was a familiar boat, the Cerro Santiago. A second Spanish tug was in the rear. The applause on shore was acknowledged with blasts from the ship’s horn. The degree of difficulty for Baroque’s passage was actually quite low. The ship fit easily in the 1,400-foot lock because it is only 836 feet long, roughly two-thirds the length of the larger vessels. And it presented a small profile in the wind because, as a bulk carrier, it had no stacked containers. Jan Kop, the project manager for Jan De Nul, the consortium’s Belgian member, watched the careful, slow procession. “We have seen that it is working,” he said with a smile. The canal authority’s plan to move about 12 neo-Panamax ships a day now appears unrealistic — at least for the time being, according to shippers, given that many East Coast ports are still preparing the infrastructure to accommodate the big ships. Last week, after the reporters had departed, a lock gate malfunctioned during a trial with the Baroque. “That is the reason we do testing — to debug the works,” said Jorge de la Guardia, a senior official with the canal authority. The authority now says that, during the rollout period, it expects the new locks to handle no more than three ships a day. There are other loose ends, including assessing the project’s final cost. A spokesman for Salini Impregilo said the contractors were seeking at least $3.4 billion from the canal authority in excess expenses. There will be winners and losers in Panama as well. Important national issues such as infrastructure improvement and education have been set aside, said Mr. Rodríguez, the Panamanian professor. “Not a single group in the country has decided that those are a priority,” he said. Miguel Antonio Bernal, a constitutional law professor at the University of Panama and an unsuccessful candidate for mayor of Panama City in 2009, said no one dared speak out against the canal. 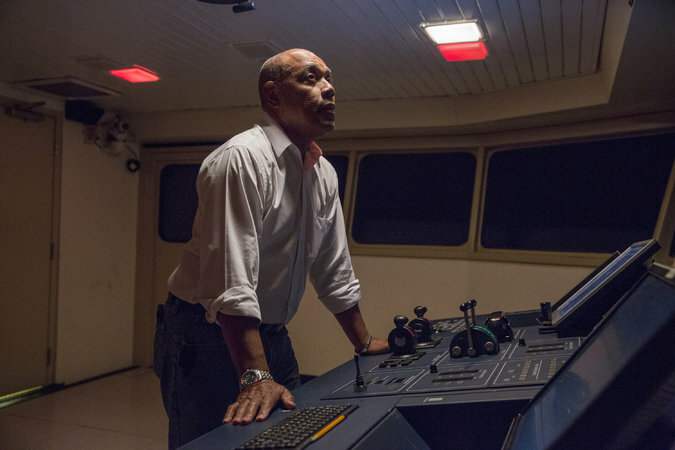 “The only thing that makes the canal Panamanian is its name, because it belongs to the entrenched oligarchy,” said Mr. Bernal, who also represents the tugboat captains’ union. Adolfo Ahumada, whose term on the canal board just expired, said serious public discussion was needed about earmarking canal income for social purposes. At the same time, he praised the board’s oversight of canal funds. “There is not a public institution whose finances are more monitored than the Panama Canal Authority,” he said. While there have been no substantiated allegations of corruption in the expansion of the canal, the authority’s image has not been helped by the fact that most of the board members were appointed by Mr. Martinelli, the disgraced former president. Among the matters being studied by investigators is a public contract, not involving the canal, given to a company owned by a canal board member, Nicolás Corcione. Mr. Corcione declined to comment. Mr. Martinelli is waiting out those investigations in Miami. He may be gone, but he is not out of touch. 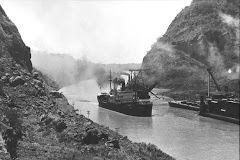 It is entirely possible that the canal will work as intended: that water will be found, that the concrete will last, that the big ships will come, and that the Panamanian people will celebrate their historic accomplishment. That is certainly the hope, even among those who have privately or publicly expressed concern about the canal’s future. Walt Bogdanich and Ana Graciela Méndez reported from Panama City, and Jacqueline Williams from New York. Produced by Larry Buchanan, Aaron Byrd, Hannah Fairfield, Matt Ruby, Jeremy White and John Woo. Drone video by Larry Buchanan and Digital Drones Panama for The New York Times.